The guys from BSNL seem to be reading this blog after I posted my letter here. I examined my traffic logs today and found two referrals from kttp://kerala.bsnl.co.in . Anyway, several officials are visiting our street regularly after my blog post. Yesterday, they replaced the junction box. See the pictures below. I am planning to stop complaining about the joints. Other wise , BSNL may allocate (in the next budget) several crores of public money to teach their line staff about how to crimp a cable pair to a junction box. 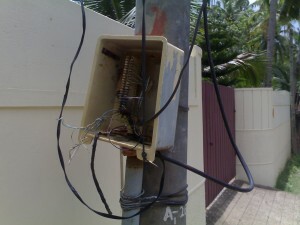 Now , the section from the junction box to the phone remains to be fixed. I am firing off a letter thanking the CMD for changing the junction box. BSNL seems to be trying to close the case . See the status update on their site. Meanwhile , I have brought the issue to the notice of our residents association. The residents association president told me that several residents are facing similar problems. 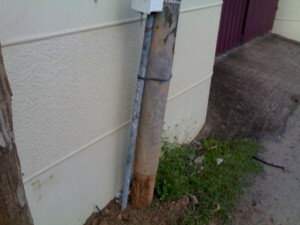 He showed me several other open junction boxes and over hanging wires in our street . He has also promised me to write a formal letter to the chairman and managing director about the problem. ( I am sure no other official will respond ). Let me see if I can get some more pictures from the street . Blogging can work wonders in India too . 😀 Please stay tuned for more update. I have just sent this Email to all the concerned officers. 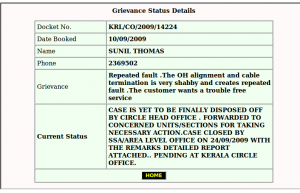 This has reference to my complaint in Kerala Circle Circle PG cell vide KRL/CO/2009/14224 and my blog post. Thank you very much for taking the initiative to change the DP. I have posted my additional comments on the problem here. 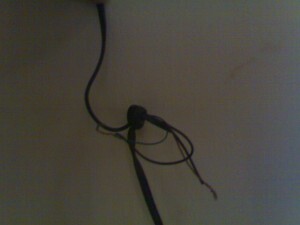 The case is being closed with out replacing the faulty cable joints. My dial up internet is getting disconnected every time some electrical disturbance occurs. . 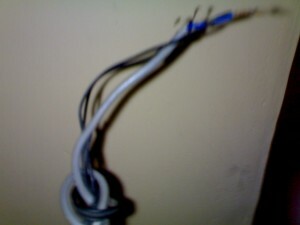 Please refer to this picture of the connection inside the house. This is remaining the same. I am too fed up with dealing with your engineers and field staff who have no clue to what a customer needs. I am actively considering the idea of shifting over to some other player. Thanking you for all the help. I received this reply from BSNL today. I am back home after a long journey. Someone from BSNL claiming to be Sub divisonal engineer called me up just now. She asked me what time I am available at home. I told her “8pm to 8 am ” . She told me that BSNL is not working at such odd times and advised me to be available at home during their working time so that they can fix the joints. How ridiculous the BSNL employees are ? They are still in 20th century and they expect a customer to wait for them. I can get a new phone from reliance or TATA round the clock and they will attend you at your convenience. I am sure Goverment of Inda will disinvest this monster shortly. My complaint is pending with them for the past 25 days and they are still looking for excuses. I have a land line connection at home. It is from BSNL, the state owned Telecom giant in India. I am too disgusted with their service and shot of the following email today to all publicly visible BSNL officers. Let us see whether email work in India. The exact nature of the problem cannot be described in words , so calling customer care is useless. 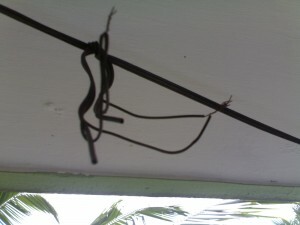 See the pictures below to have a general idea of problems with my BSNL land line. I live in a urban area. 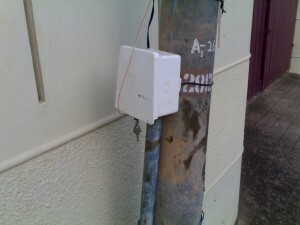 If the connection is like this in a city, the situation in villages will be much more pathetic. I am an unfortunate customer of BSNL having the land line no. 0471-xxxxxx . This phone has never worked for 3 days at a stretch. 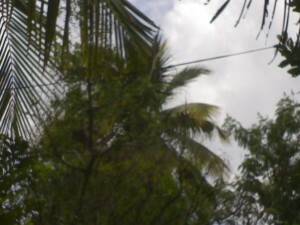 The connection coming to my home is hanging on the poles and is within the reach of even small children. Every time a vehicle passes the cable breaks. There is no RJ 11 outlet inside the house. The connection to the instrument is given is the most unprofessional manner. I have booked umpteen number of complaints . 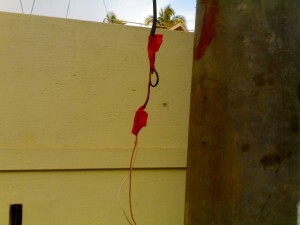 Each time they come and cut the overhanging cable and fixes it . In effect , if I want to make a call I have to go to the neighbour and file a complaint first. Dejected and disgusted with the kind of service and the personnel dishing out the service, I am surrendering the phone. I know emails wont work in a government company like BSNL, so I am CCying the mail to all addresses that I can find right from your minister to the local exchange. So please excuse me if you have received this mail in mistake. Also, I am writing an entry in my blog on the status of Consumer Satisfaction in BSNL. Please read it here. I have some interesting pictures too. Thanking you for the services rendered so far. 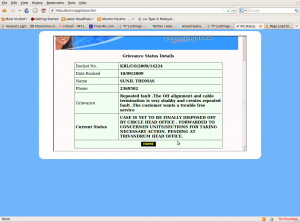 –http://bsnl.in/pgstatus.htm or www.keralatelecom.co/grievances by feeding the above docket Number and first two letters of your name ie “su” . But wait, look at the web links they have forwarded. I looked at the other URL and got the following screen. A line man from BSNL appeared today. He was looking violent. I had warned my wife and children about a possible attack from BSNL personnel. 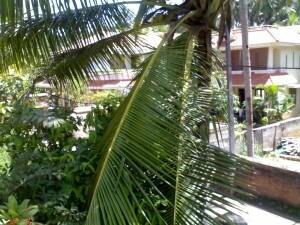 He pulled down two leaves from my coconut tree . See the picture below. Tried to fix some joints. Finally , he located the fault to one of the joints that I posted yesterday. The original joint was replaced with the joint give below. This is inside the house. I think , I have to take fire insurance for the house thanks to BSNL. Oh! I forgot to mention , BSNL it self is providing insurance . See this . How thoughtful they are, expecting this kinds of hazards for the customers. He then replaced the original phone with another. Now , the phone is working. 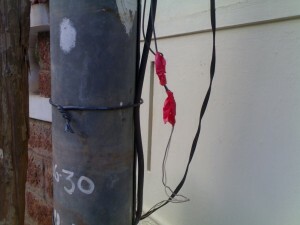 But the overhanging wire and the open junction box remains the same. My phone works for now and possibly it will work till this evening . I used to use dial up internet some time back. I plugged in my lap to the line and tried to access internet . As expected the data rate is some thing like 1bit/sec. The idiots manning the lines have no idea how I use the phone. For them , phone is just for making local calls. No wonder people are massively surrendering land lines. Hail reliance and Tata, at lease their personnel are user friendly. I am sending the following email to BSNL so that my complaint is not closed prematurely. They fixed the phone . I have posted some more pictures for your kind reference on my blog. Also, posting them to my twitter account and other activist group emails. I know your men will close the complaint immediately . I have got this kind of fix several times already . I want a permanent solution to the open DP and the wire joints. I got another email from CMD bsnl as below. This seems to be a routine reply. Telecom circle / Telephones for necessary action with intimation to you. I was playing with my bitx build yesterday. Specifically, I tried to add CW to the rig. Original bitx20 is a SSB rig. I my mod was inspired from PY2OHH bitx40. 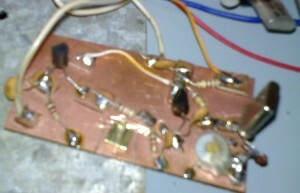 I wired up a 10mhz crystal oscillator as shown below. 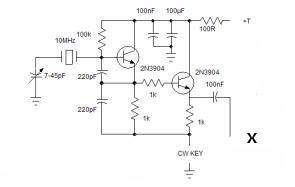 The idea is to inject 10mhz ( approximately) at the beginning of transmitter IF amplifier. This will in turn produce 14 mhz sine wave at the output. The receiver part is unmodified. See the diagram below. Connect the point marked X to the point x . Adjust the 10Mhz oscillator to around 700khz above the BFO frequency. I added a small inductor (10 micro henry) in series with the crystal to adjust the frequency near BFO,.It is not shown on the figure above. I am using pidgin as chat client for both yahoo and gtalk. Recently, yahoo has stopped support for older versions of their own yahoo messenger clients. ( anything less than version 7.5 fails ) . It also means that most of the third party clients such as pidgin has problems in login. 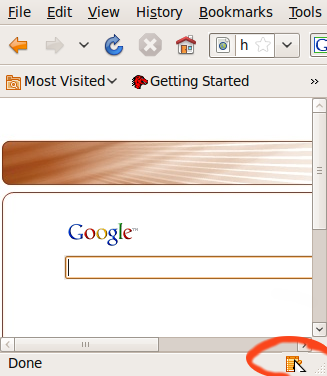 On my ubuntu 9.04, the default pidgin version is 2.5.5. You can work around the yahoo login problem as shown below. Pidgin 2.5.7 which fixes the yahoo login problem is out. You can install it as given below. Run apt-get update and apt-get install pidgin. The PPA contains new pidgin releases for other versions of ubuntu ( dapper gutsy, hardy ,intrepid and karmic) You can just replace jaunty in sources.list line indicating this ppa with you distro and enjoy yahoo messenger on pidgin. Scribefire is a cool firefox add on which a blogger cannot miss Using this firefox add-on, you can blog with out leaving your browser. Installation is simple. Browse to this page Just click on the addto firefox button and restart firefox. You can start scribefire by clicking on the scribefire icon. It will open up scribefire as shown below. Now, you can set up a blog account from the blogs menu and start enjoying scribefire. 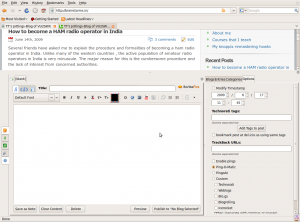 It supports several features such as notifying various blog aggregations services , ftp uploads etc. Have a look at the features.